Note to readers: in this article the term "The Land" appears often, this refers to the Land of Israel, which to us, the Jewish people, has always been simply "The Land". This term has existed for thousands of years, "The Land" is our land, the land of Israel. This predates the modern State of Israel by several thousands of years. He is a Krav Maga instructor, born in the United States about fifty years ago holds a Masters degree in Economics and Finance, Worked for several years on Wall St. Was a Rabbinical student in his past. Today he leads groups who come to the Land especially to learn Krav Maga from him; he travels all over the world to teach the Way of Krav Maga, which was born and developed in the Land. Most of his students are not Jewish and he integrates in their training a great deal of Zionism and love for the Land and thereby sends them back to their lands as new "Ambassadors" for Israel, Friends and supports of Israel. Moshe Katz, a veteran resident of the Town, who lives in Mitzpe Nevo, in a fascinating interview. The English speaking group including people from many different countries and continents such as the United States, Great Britain, Germany, Switzerland, South Africa, Iceland and more, was led by Moshe Katz, a veteran resident of our town, who resides in Mitzpe Nevo. He is a Krav Maga instructor, born in the United States and aged about 50 but looking many much younger than his actual age, he holds a Masters degree in Economics and Finance, Worked for several years on Wall St. Was a Rabbinical student in his past. Most of his students are not Jewish and he integrates in their training a great deal of Zionism and love for the Land and thereby sends them back to their lands as new "Ambassadors" for Israel, Friends and supports of Israel. When he speaks of years he refers to them in terms of Israel's wars, "I arrived here just after the Six Day War. "That event happened during the Yom Kippur War", "I returned after the First Lebanon War". The house in which Moshe resides, looks like a military training camp. One can find there all the items and accessories one needs to train; mats covering the floors, weights, rubber guns and knives, sticks. The walls of the house are decorated with photos and momentous from Krav Maga training around the globe. There are certificates of appreciation from the United States Military, the Canadian police force, groups from Holland, Italy and more. You only began with Krav Maga in your 20's, how did it all begin? I was a yeshiva student (Rabbinical college), all day I sat and studied and I felt I was not using my body at all and I was really in need of physical activity. I began training in Karate in the evenings, and even though it was the evening hours I still faced opposition from my teachers, the rabbis, who claimed it was a waste of time. I returned to the United States to complete my university studies and I worked on Wall St. This was after I came to the conclusion that I need a practical profession. I am very pleased that my hobby has become my profession but for many years I did work in the financial field although I never enjoyed it. Back home in Israel at a certain point I was asked to teach karate to kids groups here in Mitzpe Nevo. Over the years I transitioned to Krav Maga and self-defense. My reasons are that I find the Japanese martial arts no longer practical for today's self defense needs, they come from a different land and a different culture and a different time period. I see them as sport and art more than actual self –defense. Another reason for this transition to Krav Maga is that Krav Maga was born and developed in the Land and I am a Jew, an Israeli and I am proud to belong our this people and this land and to represent Israel. Therefore it is more logical that I should work with Krav Maga and not something that belongs to the Samurai or Ninja. With Krav Maga we are contributing to he world from our knowledgeable and there is no imitation her of other cultures. Today you lead and instruct groups from all over the world and in the Land, tell us a little about these groups that come to our land. They come to the Land from all corners of the earth. I am happy that they often find me through the oldest, and perhaps most successful, form of marketing; word of mouth. My reputation proceeds me these days and my program, "Krav Maga Tour and Train" is well known. There was a time when people came only for training, to learn Krav Maga. One day one of my students from Australia said to me,"Moshe, the only part of Israel I have seen is your house and the Mall, can we see something else?" That is when the idea for Tour and Train was born, I realized also the significance of incorporating history and culture into our Krav Maga program. They come here and become integrated into the community. I rent out rooms and apartments in the the neighborhood, thus also providing extra income for members of my community. I take them to the Adumim Mall and thus provide business to the many stores in our town. You also incorporate in your training program Jewish and Israeli elements? We put in about 14 hours per day. During the "Tour" part of "Tour and Train" I take them only to places that teach and exemplify bravery and courage, so they should understand that the Jewish nation is a warrior nation, a fighting nation and is not "led like sheep to the slaughter " as was erroneously said about us concerning the period of the Shoa – Holocaust. We take them to Masada and tell the story of bravery, to Ammunition Hill, site of a key battle in the liberation war of 1967, the Old City, and Yad Va Shem Holocaust Memorial where I tell them about the Warsaw Ghetto Uprising and the Partisans. I explain to them that in every ghetto, in every concentration game, despite all odds there was an attempt to fight back. They are fascinated to discover that we were not just victims but fighters. In this group there was one young German fellow who just broke down in tears when he saw the exhibits at Yad Va Shem. As I mentioned almost all these guys are not Jewish. I also take them to the Judean desert and we meet with Bedouin. We sit with the Bedouin in their tents and drink tea and coffee together. The students see the genuine friendship I have with our neighbors and they understand our desire to live in peace. They quickly realize that much of what they see on Television and hear from politicians is pure fabrication. In our local Adumim Mall I point out to them young Arab women with children and a baby carriage. They are enjoying a day of shopping and coffee. I tell the group to see with what confidence these Arab women walk around, it is clear to them that they need not fear anyone; no harm will come to them. As a contrast I tell them that no sane Jewish woman would ever go into an Arab town with a baby carriage. I have heard more than once that they return home and tell their friends about the good treatment we the Israeli Jews have towards the Arabs. They have seen it with their own eyes. I know that beyond learning Krav Maga they are learning who we are,; the people of Israel. They see we are nothing like the depictions of the international press. I am a person with a beard and kipa (Jewish male head covering), I have a Jewish religious "look", and as such their stereotypes image are broken concerning Jews and "Settlers"
I see this as a huge and significant mission, much more than a job. Even during our coffee breaks I put on films about Masada, the Holocaust etc. I have been "international" for more than five years now. Students come from Iceland, Norway, South Africa, the Netherlands, Japan etc. It is very important for me to include women in our program. Krav Maga is practical self defense and empowerment and it is very important for women to know how to defend themselves. I was among the imitators of some programs for women in Israel and received an award from the Jerusalem municipality, for the religious population this was difficult to accept. They saw it as "Immodest" and not appropriate for women. I believe this to be a huge mistake. In the current group there is a woman from Japan. She spent over two months in Israel training in Krav Maga with me, she has now returned to Hiroshima to open a Krav Maga school. The system that you teach, it is your own personal development? I have modified the Krav Maga system and developed many new techniques and strategies based on the Krav concepts. Moshe shows me (Dalit) a few traditional Krav Maga moves and the new modifications he has introduced. He adds, "Danny Sanderson also has relevance to Krav Maga." His parents were friendly with my parents back in the 1970's. We lived in the same community, Savyon. When they passed away Danny tells that when he and his sister went through their parents belongings they found huge amounts of totally useless objects such as old bus tickets and match boxes from restaurants that closed down decades ago. They decided they had to take a minimalist approach; get rid of everything that is useless, empty our drawers and through things away. I realized that in fact this is what I must do with Krav Maga; not hold on to techniques that have traditional or sentimental value but to minimize and only hold on two what is useful to us here and now. Moshe explains that part of the Krav Maga philosophy is to never let anyone control you. You must control the situation and your actions. He uses a visit to the pub as a way of analogy. "A man goes into a pub with his girlfriend, he has planned a nice evening and suddenly he finds himself in a fight with some idiot, which was not his intention at all when he entered that pub. It turns out that he is not in control at all. Someone else made decision for him that he would be involved in a fight. Someone dragged him into his negative energy. If you are in charge then you decide; you do not let someone else decide for you. In Krav Maga you must be in charge, do not let anger or someone else's energy drag you into a situation you will regret. Before we part ways Moshe asks if he can teach me a few techniques. We begin with a forward strangulation, first he demonstrates the technique and then it is my turn. On my second try I am already doing it correctly and easily succeed. I was somewhat skeptical but it turns out his system is simple and easy to learn; practical and too the point. Krav Maga training in Philadelphia. Most U.S. media outlets have carefully considered positions on Israel. But the martial-arts press—everything from magazines like BlackBelt, the bible of martial arts, to the producers of books, videos and and even two recent TV programs, The Human Weapon and Fight Quest—have a straightforward stance: they’re staunchly pro-Israel. That’s not to say they’re anti-Arab or anti-Muslim, but they’re not at all conflicted about the skills, competence, and integrity of Israel’s fighting men and women. The Israeli commando is regarded as the martial ideal. Krav Maga, the Israeli martial-arts form, is what impresses the observers. It was the brainchild of Imi Lichtenfield, a boxer and wrestler in his native Bratislava, Czechoslovakia, who in the 1930s taught self-defense to that city’s Jewish population, under siege by local fascist gangs. When Lichtenfield moved to Israel in 1942, he worked with the Haganah and Palmach and later the IDF ( Israel Defense Forces ) to develop a self-defense system that borrowed from other systems, like the Japanese arts judo and karate. Where most martial arts take years of training to become proficient, Krav Maga, which translates as contact combat, was suited to the exigencies of a growing community of non-professional soldiers that needed to learn how to protect itself and fight in a hurry. Its emphasis is less on form than efficiency, and it instills a spirit of heightened aggressiveness, where practitioners are taught to attack and defend at the same time and use any available object as a weapon. Krav Maga made its first U.S. appearance in the early 1980s, when a number of Israeli trainers arrived to instruct military and law enforcement personnel, including the FBI, and civilians. Krav Maga wended its way through mainstream American culture, featured on nightly news broadcasts and talk-shows, and interest culminated with a 2002 film, Enough, starring Jennifer Lopez, in which her character, after an intensive course in Krav Maga, throttles her abusive husband with a series of well-placed knees, elbows, and eye-gouges. Israeli martial arts is not a self-defense technique; it’s a combat art. “Israeli arts are reality-based,” says Dana Stamos, a martial artist who runs USADOJO.com, a major martial-arts website. “Israelis are fighting every day,” she says. “So people think this will be up to snuff, like Navy Seal training. We don’t have combat in the United States, so we don’t comprehend it. Many dojos today are about developing character, not training you how to stick a knife in someone and kill them. But a combat art is a killing art. Police officers occasionally find it necessary to defend themselves against aggressive suspects. Thursday a group of officers from varoius agencies learned how Israeli police stay safe in potentially lethal situations. Moshe Katz of Maaleh Adumim, Israel, conducted a pair of training workshops in the Israeli self defense skill of Krav Maga at National Guard armory in Effingham. Katz, head instructor at Israeli Krav International, is a fourth degree black belt. "Krav Maga" is the Hebrew term for close quarter combat, something anybody who watches police reality shows sees on a semi-regular basis. Katz said the defense form is easy to learn and effective. "It's very simple," Katz said, "People can pick up certain techniques in as little as 30 seconds." He said Krav Maga is so easy to learn because it involves more gross motor skills than other forms of self defense. He added there's some versatility involved, as well. "It can be applied to different situations," he said. Krav Maga is particularly useful in close quarters that render other martial art forms useless. "The sad and cruel truth is that you can be attacked anywhere," Katz said. "You can be attacked on the stairway, which completely eliminates all your fancy kicking techniques. "You can be attacked in the snow by a guy wearing a heavy snow suit, which completely eliminates your Jujitsu wrist locks. None of this will be at all similar to the training you did at your karate or judo school." 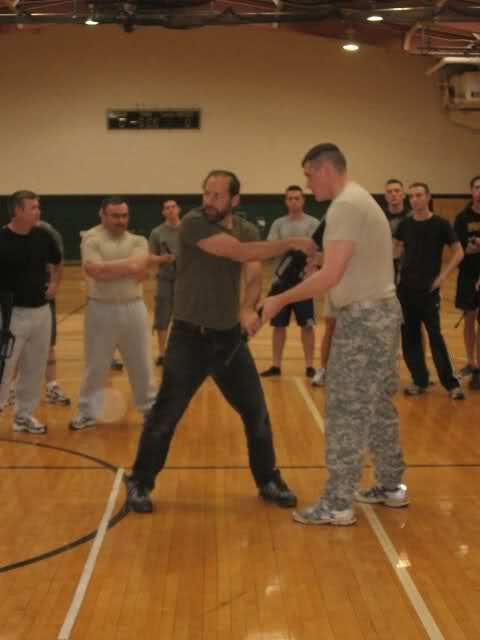 Krav Maga training focuseson realistic situations that police coudl fact at any time, Katz said. Effingham County Sheriff John Monnet said the art can help deputies face down sticky situations. "We come fact-to-face with many altercations," Monnet said, "We need this kind of training all the time." The Effingham County Sheriff's Department and the East Central Illinois Law Enforcement Training Team sponsored Thursday's training session. But the Sheriff said he plans to continue the training within his department. "If we didn't continue to practice, it won't do us any good," he said. Illinois state trooper Chad Smith, a control and arrest tactics instructor, said attending Thursday's workshop will enable him and other instructors to provide more varied techniques to their students. This enhances our hand-to-hand combat skills and gives us more things to learn." Smith said. 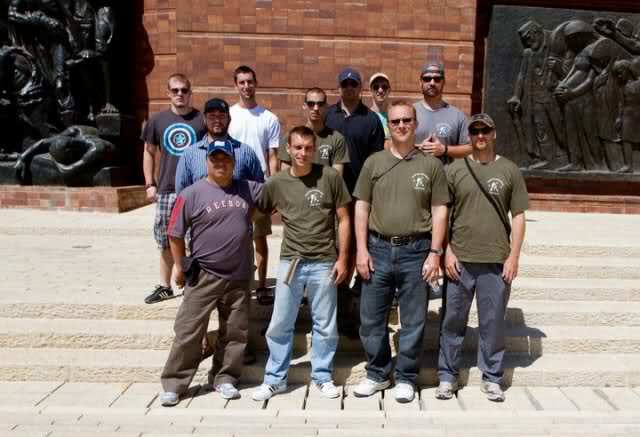 Media Credit: Cynthia K. Merchant Personnel in various government agencies have received training in Krav Maga, including the FBI; the Marine Corps; the Bureau of Alcohol, Tobacco, Firearms, and Explosives; the Treasury Department; and the CIA. 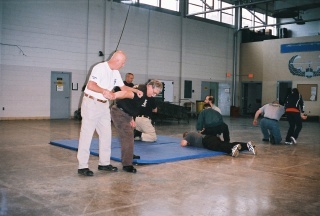 Police departments in Alabama, California, Connecticut, Illinois, Maryland, New York, Pennsylvania and Texas also have utilized Krav Maga techniques. Have you ever wondered how to break a headlock? What if someone is holding a knife to your throat? Israel-based martial arts instructor Moshe Katz addressed these questions — and more — to an audience of about 30 on Wednesday night in Hillel. Over two hours, Katz instructed the attendees with the proper way to defend against a series of grabs, chokeholds, guns and knife attacks. He demonstrated techniques and then attendees broke into pairs, practicing the techniques themselves. Oftentimes the exercises were met with exclamations of surprise at just how effectively the simple movements disabled their hypothetical attackers. College senior Oren Lavie called the event “fun and applicable.” Engineering senior Riki Sun elaborated on the usefulness of the training. “Philly is sometimes too dangerous, and learning how to defend against a knife, handgun, and even without [weapons] is very helpful,” Sun said. Golan said that the Krav Maga session served “to promote self-defense in a fun and interactive way.” He added that “the idea is to get everyone excited for Israel week, for which this is a precursor.” Penn Hillel’s Israel Week is scheduled to run from April 4-8. Golan described the event as a success, but he said that the combination of St. Patrick’s Day and a Jewish fast day — preceding the holiday of Purim this Saturday night — may have detracted from the event’s potential attendance. An Israeli Krav International school, owned and operated by Tim Hillis, was asked to be featured in Martial Arts Experts Magazine - a product of In-Tys Media Group. This magazine is reported to be the leader in it's industry for Canada. Mr. Hillis was very happy to give the world a new look at Krav Maga as taught by Israeli Krav International (IKI). The evolution Krav Maga has taken under founder Moshe Katz and President Itay Gil is exploding as people recognize the tactical soundness of not only the techniques, but the bio-mechanical science behind them (a phrase first coined by IKI president Itay Gil). With the combined experieince training Sayeret Duvdevan, YAMAM, the Israeli Presedential Security staff, the Israeli Prison Service, elite security personnel working throughout old city Jerusalem and et cetera Moshe Katz and Itay Gil have developed a Krav Maga for the 21st century. Taking into consideration collateral damage, ease of use against skilled opponenets and while under extreme stress, IKI Krav Maga can and does work for any body-type against a myriad of threats not before considered in most Krav Maga programs. What if a person finds themselves in an airliner and needing to disarm an gun wielding attacker? Using the older methods, every person opposite the dead side of the weapon will be muzzled by the gun. Not so with IKI Krav Maga, the gun is immediately redirected downward - NO ONE gets muzzled except the bad guy as you complete the bio-mechanically correct disarm. Cottonwood Combat is authorized and available for affordable seminars to : Martial Arts Schools, Law Enforcement Agencies, Military Installations and etc. Cottonwood Combat is the Verde Valley's ONLY source for Krav Maga, the Official System of Self Defense for the Israel Defense Force. Our Chief Instructor has nearly 10 years experience teaching Israeli Self Defense systems. Cottonwood Combat is an affilate of Israeli Krav International founded by Moshe Katz and headquartered in Maaleh Adumim, Israel. Itay Gil (from the Human Weapon episode on Krav Maga) is the President of IKI. See our KM Video page to watch the Human Weapon for Free! This past Thursday, I punched myself in the face. This wasn’t anything I had planned or even intended to do. It wasn’t some attempt to make a friend laugh. It was merely a rude reminder of my own lack of coordination during my first Krav Maga self-defense course. I learned Krav Maga is an Israeli martial art developed by Imi Lichtenfeld and employed by special forces and police units around the world. 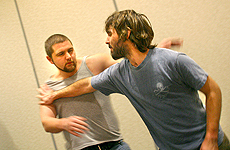 It is an effective close combat fighting technique which, unlike most eastern martial arts, focuses on function over form with staggering results. Hokies for Israel invited Krav Maga instructor Moshe Katz from Israel to teach self-defense classes to Virginia Tech students. There were a few specialized classes for women and the Corps of Cadets, but I was fortunate to make it to one of the open sessions. We learned how to protect our heads from attacks while being able to retaliate with our legs. It was at this point I realized how very out of shape I had become. When the mock firearms came out, I realized this was not the same kind of martial art I so fondly remembered from my elementary school stint in Tae Kwon Do. Katz began showing us how to disarm someone holding a gun to you. We learned it from a variety of positions — standing, seated, pointed at your chest, head and back. Two things ran through my head at this point. First, I was glad I was never mugged in my many nights spent walking to 7-Eleven in Richmond. Second, if someone did have a gun pointed at me, I would probably hand them anything they asked for, likely with a side of unintentional fear-leakage. This is something Katz endorsed; if someone is after your wallet, just give it to them. However, the reality of the situation, especially in Israel, is that a Krav Maga practitioner has to be ready to defend his life, not just his bank account. This is about when I punched myself in the face. The fluid motions Katz was pulling off require years of practice to execute perfectly. In my hour-and-15-minute Krav Maga career, I didn’t master any of the techniques. However, Katz armed me with knowledge and more importantly a non-victim attitude as well as a desire to learn more about this uniquely Israeli style of self defense. There aren’t any Krav Maga centers close by — at least none I have been able to find — but I’m positive I’ll be joining one if I ever move to the appropriate area. “You shouldn’t have to train for years to be able to defend yourself,” explained Moshe Katz, our Krav Maga instructor from Israel. As we learned in Moshe’s workshop, Krav Maga, an Israeli martial arts practice, is based on the principle that self-defense should be intuitive, easy to learn, and effective in a crisis. “If you forget the maneuvers, the technique is not helpful” Moshe told us, comparing the surprisingly simple Krav Maga techniques with the more complicated movements found in some other self-defense traditions. Along with funny sports metaphors and quips about the Boston Red Sox (“I love teaching workshops in America, because everyone gets my baseball references here!”), Moshe taught a small group of Harvard undergraduates — some who self-described themselves as “living in Hillel” and some who had never stepped inside the building before — the basic Krav Maga techniques. Moshe gave individual pointers as participants learned to jump out of the way of danger while using their bodies as leverage to force themselves out of an attacker’s grip. Moshe taught us the art of twisting out of a hold, rather than pulling out. It worked miraculously! Even our football player friends from Quincy house, Ablorde Ashigbi and Gino Gordon, were amazed at how easily Molly Moses, one of our more delicate participants, slipped out of their strong grasps using the techniques Moshe described! 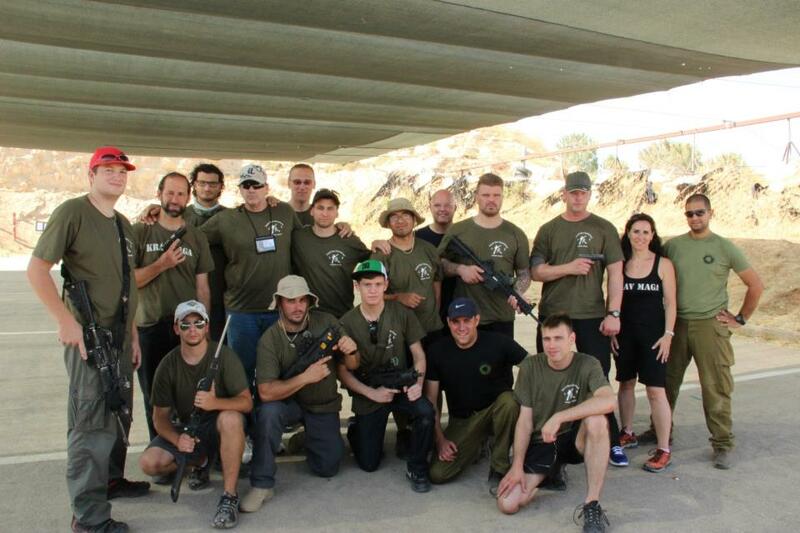 Given Krav Maga’s highly effective and time-efficient training method, it is no small wonder that these Israeli techniques are taught to police, security teams, and military — including the United States military. Harvard Hillel is extremely lucky that Moshe Katz made a special effort to share these techniques with us in Beren Hall last February. We are equally lucky that The David Project Center for Jewish Leadership generously supported Moshe’s workshop. The David Project (see www.davidproject.org) is a nonprofit organization dedicated to educating and inspiring strong voices for Israel through dynamic educational seminars, workshops, and curricula. Harvard Hillel hopes to have Moshe’s effective, entertaining, and extremely useful workshop return in future years. "What we've done is chipped away and gotten rid of anything that's not the most brutally effective," Katz said. "When they train people in Krav Maga in the army, the number of techniques is so minmal, what they work on is aggressiveness, motor skills; they do it to do it when you're dead tired if it doesn't work then, what use is it?"